The Lord is still watching over us through your prayers and He has shown to us that He is indeed Jehovah the provider and that he cares. When you don’t know where the next meal will come from, he says, look up to me as your provider. Please help us to thank the Lord for Mother Charlene in America for her devotion and dedication to the project, she has opened for the organization doors that we NEVER expected. End of 2016, a lady by the name of Summer Jackman who is based in USA pledged to build us a library and stock it with books. 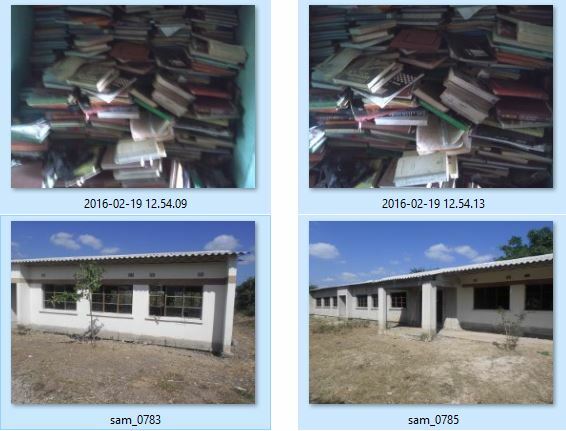 The library is still being worked on, below are photos of the unfinished library for Nyamphande Miracle Village. 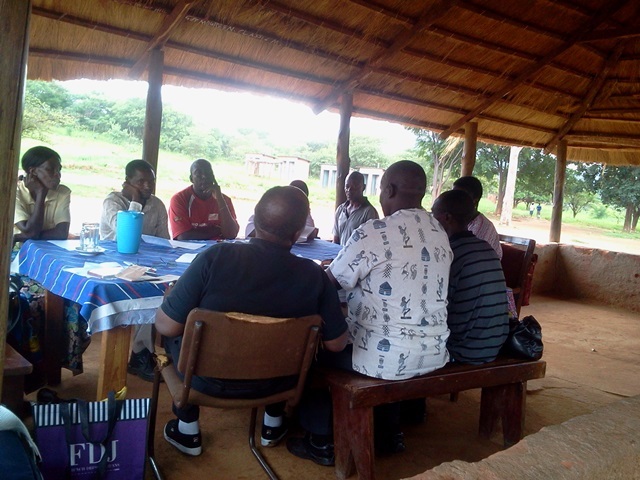 This is being done by the help of the Maluba Rotary club in Zambia. The Maluba Rotary club will build the concrete slab where library will sit. 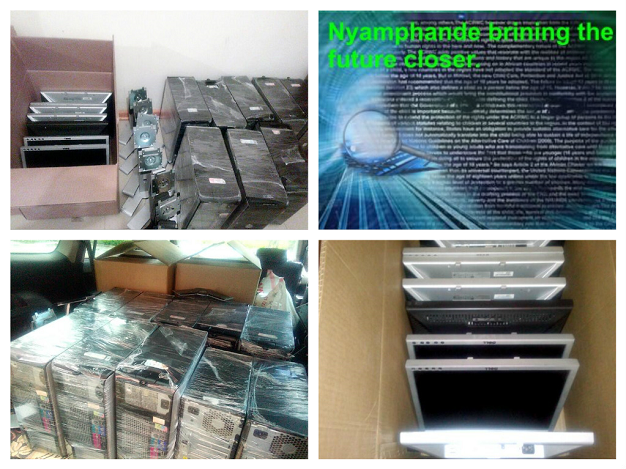 Board Chairperson Apostle Cosmas Mwananshiku has donated K 20, 000.00 to buy Computers for the School. We cannot stop to thank God for we have been knocking doors locally so as to source for computers for the Computer lab - this has also come at the right time. Nyamphande will have a new Library and also have new computers to help the children with their studies as the world has changed. Donated Desktop Computers! 8 full set Dell OptiPlex 780- Core 2 Duo 3 GHz. 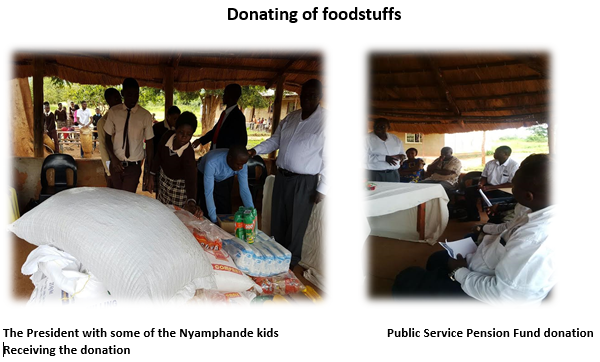 On 8th April 2017,Nyamphande received assorted essential commodities from the Public Service Pensions Fund. The Public Service Pension Fund donated assorted commodities worth K15, 000 to Nyamphande Orphanage and community school as part of its commemoration of the international women’s day. 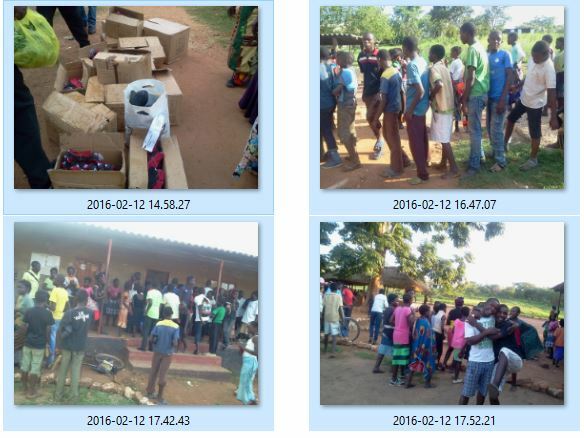 The items included Mellie-meal, washing and bathing soap, beans, kapenta, sugar, Soya pieces, rice, dish washing liquid and insect killer. Speaking at the heading over of the items Public Service Pension Fund head of public relations Mr. Alex Chileshe said employees are familiar with working in an environment of less privileged people as they undertake their responsibilities’ of paying beneficiaries of the dead workers estates and senior citizens. Mr. Alex Chileshe said PSPF realized the huge burden of looking after underprivileged children who had lost their parents and felt duty bound to help. He said orphans have so many competing needs that could pose a big challenge to the orphanages noble cause of taking care of them. 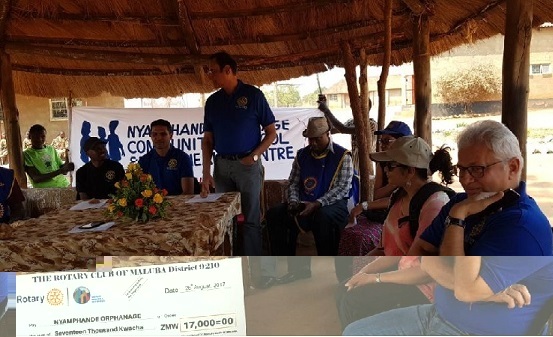 “Out of our great desire to share the little resources at our disposal we are delighted to make this donation to Nyamphande Orphanage as a way of commemorating this year’s international Woman’s day” Mr. Chileshe Said. He said PSPF over the years developed a strong corporate social responsibility program in which it has demonstrated its ability to care for others. Mr. Chileshe said the world could be a better place to live if people cared for one another. He said the firm is alive to the fact that because of its allocation in the rural area, the orphanage might be forgotten and those who may want to help usually concentrate on other orphanages located in the capital (Lusaka) meanwhile, Nyamphande orphanage president John Mambo said he was very happy with the kind gesture by PSPF. “My heart is full of joy and I am touched by your action because you are demonstrating what is written in the scriptures,” Bishop Mambo Said. And speaking at the same event Nyamphande Acting school head teacher Joseph Buti said the Orphanage was founded in 1996 and has grown from being a primary school to a secondary school. He said the school has 17 teachers and four supporting staff. School head Girl Lyndia Mwanza said she was very happy that PSPF had helped and urged the founders to continue with the same spirit. 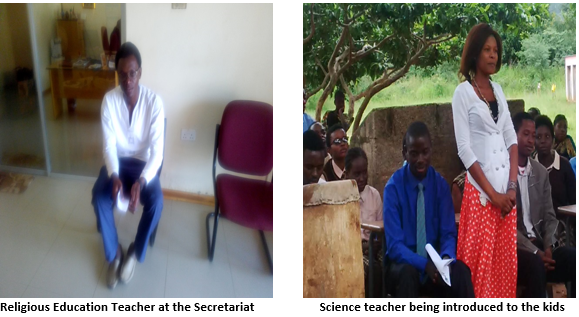 And the head boy Cornelius Mwila said he was grateful to PSPF and that he had never expected such charitable gesture. We want to express our appreciation for your generosity in support of Nyamphande Orphanage. Your assistance means so much to us and even more to the Nyamphande Orphanage children. Thank you from all of us. 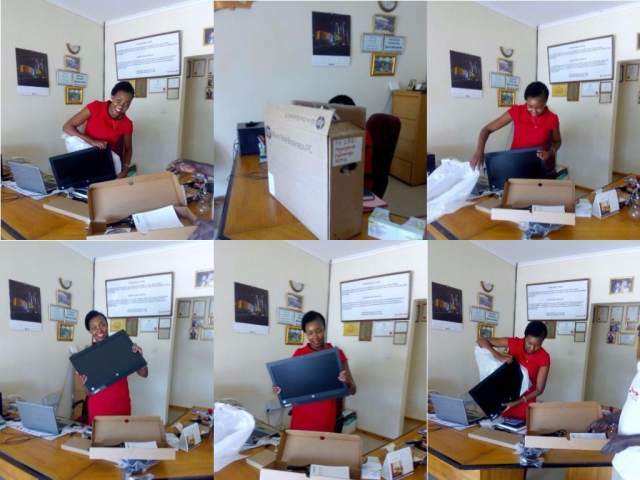 Donated an HP core i3 all in one Desktop PC for business, we appreciate your support and we are thankful for your donation. God bless! 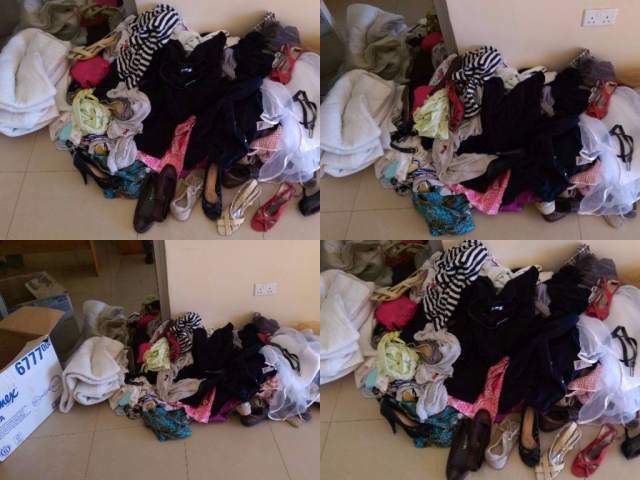 We can't thank you enough for your recent assorted clothing and shoe donations, to all the various well-wishers. Please know how much you've helped our children and how much we all appreciate it. God bless you!! Thank You All: By giving to help our children at Nyamphande Orphanage, you give them joy and hope. Your help is a priceless contribution. Thank you all for your care and May God richly bless you!! 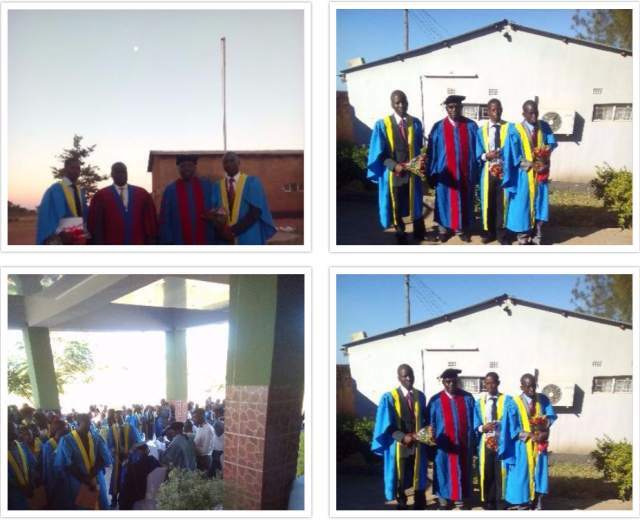 Graduation of our three boys as Teachers namely Wakumelo, Robson and Grafton. Robson got a distinction! All the three graduates are double orphans who have been raised to this date by Nyamphande Orphanage. Our prayer is for them to run the institution in the near future. We thank God for our praying partners, well-wishers and mostly the Willistone Church of God who have been laboring with us to this day. we thank each and everyone of them, God bless!! 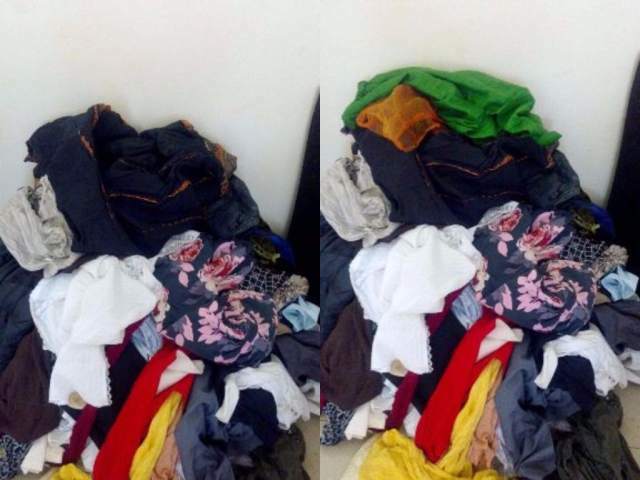 We farther request from those who can extend (give) used cloths, shoes and blankets for the double orphans to help them sleep warm through this cold season. 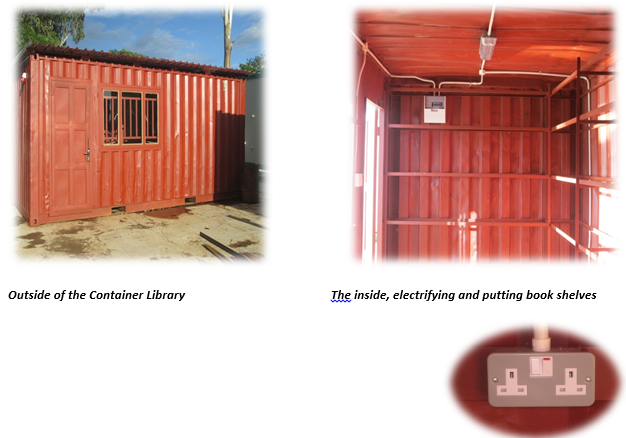 We are also working on books for a library so any donations for books are welcome. Nothing can make our lives, or the lives of other people, more beautiful than perpetual kindness! We are kindly asking from all well-wishers for some agent funding for sinking a borehole as we had no good rains last year, the current one we are using needs a solar pump. 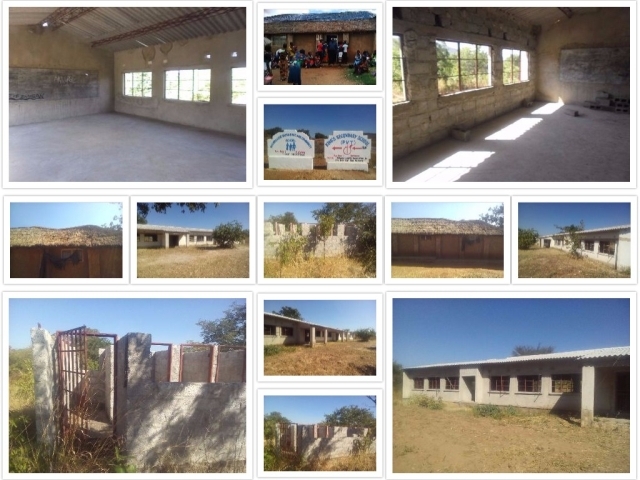 We also need to complete the high school, currently we have three streams at our school morning, afternoon and evening, and this is due to shortages of classrooms. Any help rendered will be greatly appreciated. We can't thank you enough for your recent clothing and shoes donation,we greatly appreciate all our well-wishers. People take undergarments for granted-- until you don't have. Please know how much you've helped our Children and how much we all appreciate it. Cloths and Shoes Donated by different well-wishers. Its the beginning of the year and Nyamphande Orphanage Community School (NOCS) has started on a good note, so far 535 children have reported to school and a lot more are expected to to be enrolled. 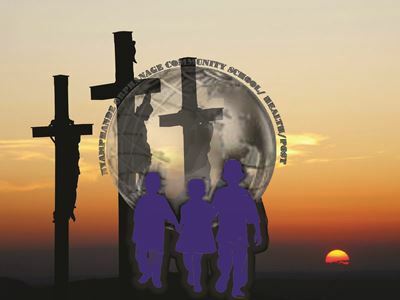 We have 414 children from pre-school to grade 7 and from grades 8 to 12 we have 121 pupils. We have also started evening classes to cater for the adults in the community who wish to get back to complete secondary school education, so far we have enrolled 5 ladies and 5 men. 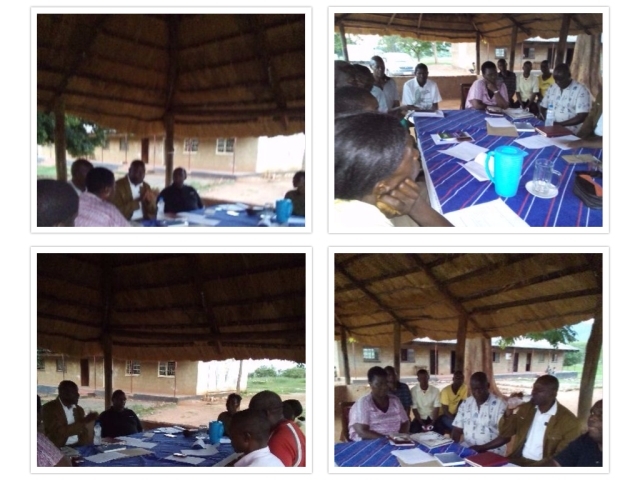 all this information was discussed at the meeting held on the 12th of February 2016 at Nyamphande community school. We congratulate Mr Boti our school manager for having been appointed as the coordinator for all the community schools in Rufunsa district. 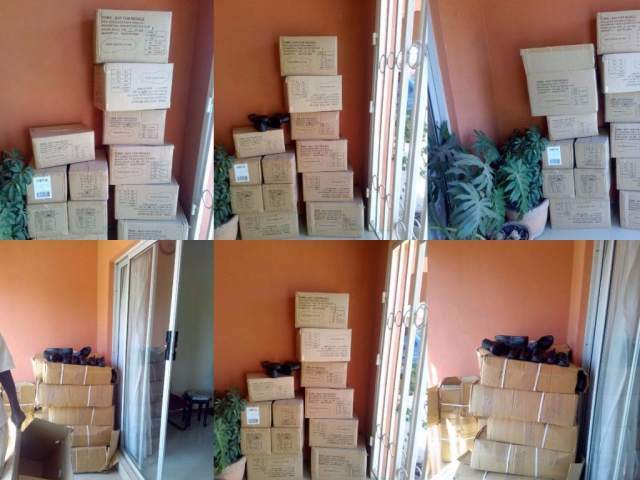 On the 4th of February 2016,Children International Zambia extended its support to Nyamphande Orphanage through a donation of 500 pairs of TOMS shoes to improve the lives and well-being of the Children at Nyamphande. 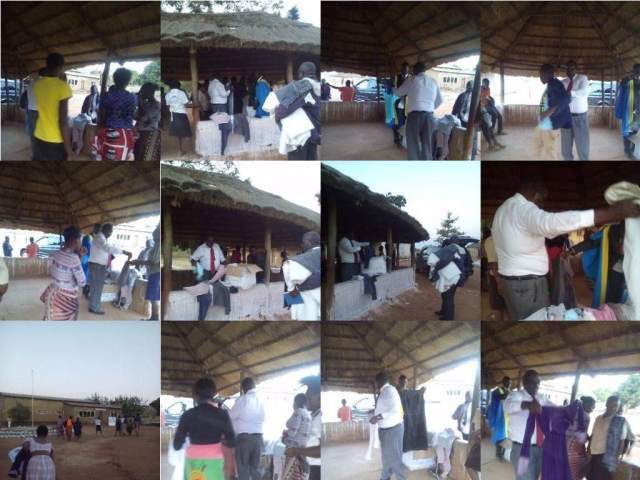 Children from grade one(1) to grade twelve (12) were catered, we did the distribution on the 12th of February 2016. We thank children International Zambia for their kind donation, God bless!! - We have no school library: lots of books have been donated but have all been put in one place and are not arranged hence they may get damaged easily. - Nyamphande Orphanage has a clinic which does not only cater for the orphaned children but for all the community with all sorts of medical services they need, ranging from HIV/AIDS counseling and blood screening, they also offer under-five clinic . The clinic roofing urgently needs renovations as it has lucked maintenance in a while. We also need help in the supply of enough medicine to cater for the Orphanage as well as the members of the community. - As the number of pupils keeps increasing,we need help so that we can complete the high school classes. - We would like to thank the Zambian Government who have seconded a new nurse to be paid by them for her services to the Nyamphande Orphanage clinic. The clinic has continued to function despite some challenges we have been having, due to the help rendered by the Government the clinic is functional and as of last week Friday, a lot of Mothers brought their babies for under-five clinic. The Government of Zambia has started a dam creation project at nyamphande and they have promised to build two dams. The project has already started there is already one dam that is running .This project is being spear headed by the area member of parliament through the Ministry of fisheries and livestock. This project is aimed at benefiting the communities in Rufunsa district, Nyamphande inclusive. As Nyamphande we are thankful to all our partners for standing with us .We have come this far because of you and we do not take you help for granted, every contribution, prayers and help rendered are deeply appreciated!